Tradeoff • Fully taxing food would permit cutting sales-tax rate on other items. 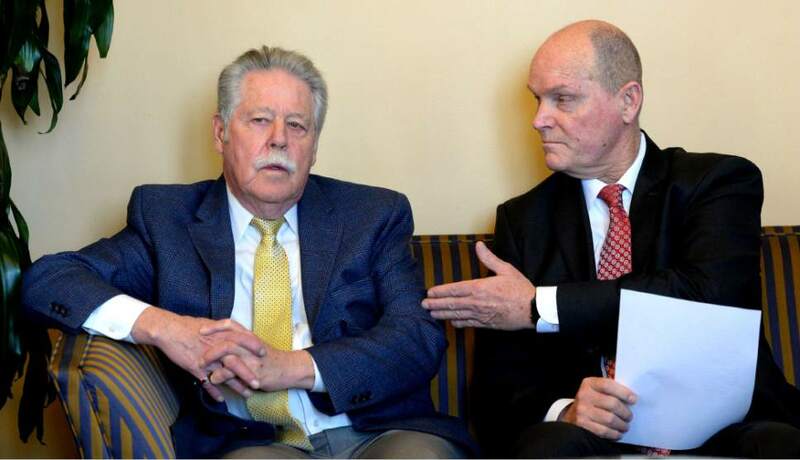 Steve Griffin | The Salt Lake Tribune Senate minority leader Gene Davis,D-Salt Lake City, left, and senate majority leader Ralph Okerlund, R-Monroe, adress the media during availability at the State Captiol in Salt Lake City Friday March 3, 2017. Al Hartmann | Tribune file photo Jay Cummins, the president of Smith's Food & Drug, left, checks out selection of heirloom organic tomatos with produce manager Mike Robinson during a tour of the grand re-opening of the store at 900 East and 2700 South Wednesday August 27. 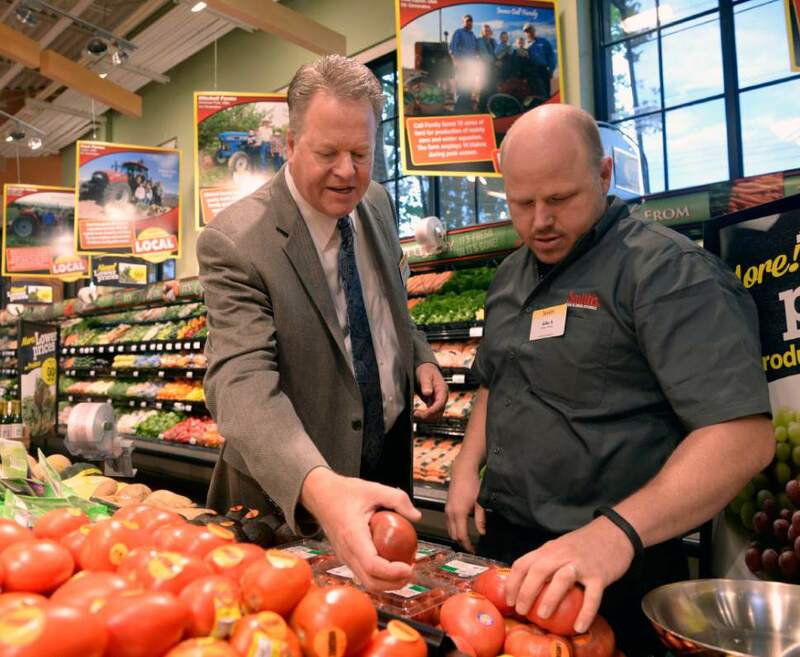 In the final four working days of this year&apos;s Legislature, House Republicans say they will push to raise the state sales tax on unprepared foods  and use that extra revenue to lower the sales tax rate on all other items that Utahns purchase. They say they will try to protect the poor from being hurt by the higher food tax by offering a refundable "grocery sales tax credit," which could give them a check even if they owe no state income tax. The House GOP also decided to drop efforts, for now, to pursue income tax reform. They said they will study that during interim sessions later this year. House Speaker Greg Hughes outlined those decisions made Friday, after the House GOP met behind closed doors for hours over recent days to discuss its options. "We are so late," Hughes conceded, but said deep discussion has helped clarify issues and will allow quick action now. "We believe there is the political will to get this done, albeit with very little time left." Optimism about enacting reform was not as high in the Senate, where Majority Leader Ralph Okerlund, R-Monroe, said Friday that it is increasingly unlikely that lawmakers will pass a comprehensive tax package this year, with the deadline for adjournment at midnight Thursday. "The closer we get to interim," he said, "the more likely it is that we solve it during interim." But Senate President Wayne Niederhauser has said the Senate seeks reform, and is flexible  and has been waiting for the House. Republicans control the House 62-13 and the Senate 24-5. Gov. Gary Herbert, who also is Republican, said Thursday he would not stand in the way of a food tax hike if there is a mechanism to offset the extra burden to low-income Utahns. House Minority Whip Joel Briscoe, D-Salt Lake City, said Democrats are still waiting to see details of GOP proposals, but question if it will hurt the poor. He notes that Republicans during this session have touted tax reform as a possible way to avoid the Our Schools Now initiative to raise income tax by $750 million. "And what will we vote on next week? Raising the sales tax on food." However, he did praise the idea of a grocery tax credit. He said the only drawback is that people who do not owe tax still must fill out a form to receive it, and many fail to do so  giving them no relief. Hughes said the proposed sales tax changes are "revenue neutral. Government doesn&apos;t expect to collect a dime [extra] from this plan. There are no additional dollars being raised in this process." However, Senate GOP plans to boost the food sales tax had envisioned perhaps using it to generate extra money. Hughes said the House would support restoring the full tax only if it is revenue neutral. "We hope we get consensus." Utah leaders have argued that 70 percent of the state&apos;s wages and sales in its gross domestic product in past years were subject to tax, but that has dropped to 40 percent. They say that has created pressure to raise rates  so they say they want to broaden the tax base and lower rates. Hughes said lawmakers are still trying to figure out exactly how much the sales tax rate would be lowered by taxing all food at the same rate  and said final numbers and bills should be finished over the weekend. Sales tax on food, however, is inherently regressive  hurting the poor more than the rich  because the poor spend a much greater percentage of their income on food and other basics. Former Gov. Jon Huntsman used that argument to help lower the sales tax on unprepared foods from 4.75 percent to 1.75 percent in 2006 and 2007. "We&apos;re looking for ways to mitigate for the low income through a grocery sales tax credit, which is something that Idaho does," Hughes said. Also, House Republicans hope to enact a state earned income tax credit for the working poor  which usually has been described as an incentive to help avoid welfare assistance by encouraging work. "Seniors or those on a fixed income may not be able to use the earned income tax credit, but they could use the grocery tax credit," which is why lawmakers hope to pursue both, Hughes said. Besides the new tax credits, Hughes said the House GOP plans to stress that "there is a myriad of other issues we have looked to this year to help the most vulnerable." He said that includes several steps to reduce homelessness, intergenerational poverty and funding for the disabled. "We don&apos;t want to be too myopic" in focusing on raising the food tax, and forgetting the other steps, he said. The House GOP did dump plans to try to reform income taxes for lack of time. Leaders had talked about trying to perhaps lower taxes on lower-income people while raising them on the rich, by reworking income levels when tax credits and deductions would be phased out. Hughes said too many issues on that remained to try to tackle it now. Sen. Gene Davis, D-Salt Lake City, said a comprehensive look at Utah&apos;s tax credits and exemptions is needed. While Senate Republicans have focused on revenue-neutral tax reforms this year, Davis said additional resources are needed to fund state programs.